By the second quarter of the twentieth century, one of the world’s most revered figures was a long-haired, somewhat rumpled European refugee. His public persona combined a Gandhi-like saintliness with the awesome impression that his sleepy-looking, baggy eyes gazed not on the everyday world of ordinary mortals but into far vistas of space and time unseen by others. This suggestion of contact with transcendent reality was central to Albert Einstein’s charisma. It arose from his success in opening the door of human imagination to previously unknown concepts of time and space. This new understanding of the cosmos displaced models of space developed by Euclid and Newton. It also had a subtler texture than theirs; Einstein’s cosmos is the domain of the subatomically small, in which previously assumed distinctions between matter and energy become blurred. Many other mathematicians, physicists, and chemists also contributed to the discovery of the new geometry and the revised notions of matter. But Einstein became the iconic face of the intellectual reformation of the early atomic age, when physics supplanted biology atop the list of disciplines seen as capable of revolutionizing human knowledge. In the late nineteenth century, the theory of biological evolution was considered the leading edge of insight into the relationship between the human species and the basic structure of the cosmos. The impact of Darwinism formed only part of this intellectual marketing coup: it was also a result of the campaigning of popularizers like Herbert Spencer, whose bestselling books presented biological evolution as the closest thing humanity had to a mirror reflecting the fundamental texture of physical reality. With the rise of Einstein, the preeminence of biology came to an end, and the new physics came to be seen as the pinnacle of man’s effort to know reality. Moreover, the status thus conferred on physicists was not merely scientific; it seemed to an awed public that Einstein and the nuclear physicists, by peering and penetrating into the structure and stuff of the universe, had attained not just factual knowledge but moral wisdom, too — a perception that contributed significantly to Einstein’s aura of detached saintliness. While nuclear physics enjoyed this marvelous public image, professionals and professors from other disciplines — from architecture to social science — began to write their papers and publications in such a way that they would sound as if they had been written, if not by physicists, then by practitioners very like them. But in the second half of the century this high ground of public adulation was lost. Fields like computer science and genetics overtook physics as the most respected and charismatic exemplars of scientific advance. Theatrical films, television dramas, comic books, novels, and other media began to promote an image of atomic science as a dangerous tool of sinister interests — corrupt politicians, cynical industrialists, and evil (or at least irresponsible) scientists — aiming to impose nuclear technologies on the world while recklessly ignoring the threats of war, terrorism, and contamination. The story of nuclear physics is one of the most remarkable marketing disasters in intellectual history. In the space of a few decades, the public perception of the atom’s promise to serve humanity, and the international admiration that surrounded the many brilliant people who unraveled the mysteries of matter, had collapsed. So pronounced was the erosion of attitudes toward nuclear physics that, by the late 1990s, several European physicists felt it necessary to establish an organization called Public Awareness of Nuclear Science for the explicit purpose of improving the public image of their discipline. 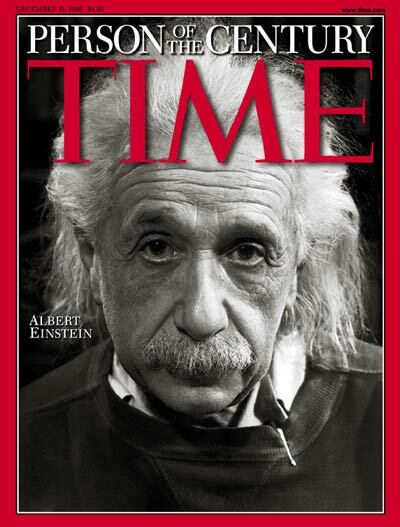 Einstein’s personal legend, however, seems untainted. Time magazine anointed him “Person of the Century” in 1999, when an opinion poll indicated that the five twentieth-century figures whom Americans most admired were Mother Teresa, Martin Luther King, Jr., President John F. Kennedy, Helen Keller, and Einstein. Of course, Einstein did not himself build any nuclear power stations or atomic bombs, or contribute directly to them; his work addressed the theoretical basis of physics rather than its applications. Indeed, after the Second World War, Einstein added his voice to those of Bertrand Russell, Albert Schweitzer, and others to urge an end to further nuclear arms development. On the other hand, it was a letter from Einstein to Franklin D. Roosevelt that had famously preceded the Manhattan Project. 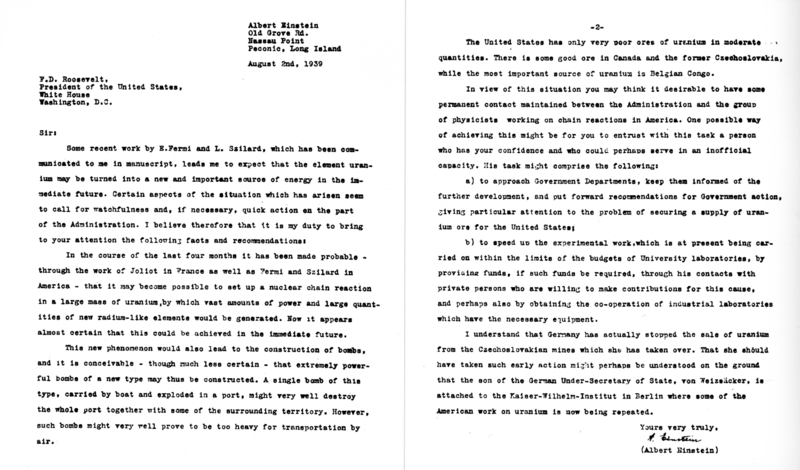 The letter warned the president that Hitler’s scientists might be developing a nuclear weapon and that the U.S. government should interest itself in American work being done on the subject. Since much momentum toward the development of nuclear weapons was already gathering, there is good reason to believe that this letter bore as much relation to the initiation of the Manhattan Project as a ceremonial drum major’s baton does to a parade along a predetermined route. But its symbolic importance at the time, given Einstein’s renown, can hardly be doubted. Furthermore, Einstein’s own body of scientific work was, if not the direct source of nuclear innovation, then at least the vital foundation to its development and practical application. So there is a sense in which Einstein is inseparable from the development of nuclear technology. How, then, has the persona of Einstein escaped the cloud that has descended on the rest of the nuclear enterprise? And if there is good reason to try to restore the stature of this enterprise, how might it be done? To begin to answer these questions, we must first come to understand why and how nuclear physics has fallen so astonishingly into disrepute. Some reasons for nuclear science’s loss of public prestige are fairly obvious — the awful things that have been identified with nuclear technology since the dropping of the atom bombs that ended World War II. The mushroom cloud, recalling the devastated Japanese cities of Hiroshima and Nagasaki, has become a charged cultural emblem, resonant with moral anguish deeply imprinted on the American national psyche. The ethical perplexity generated by the possession of such vast power was compounded during the Cold War by dread: In the Fifties and Sixties, Americans lived under a palpable threat of annihilation by the Soviet nuclear arsenal. The collective remembrance of the reality and immediacy of nuclear fear has faded as the Cold War has receded in time — so, for example, popular memory has all but forgotten the time when American homes were equipped with bomb shelters in which survivors were intended to wait through the diminution of lethal radiation after their neighborhoods had been obliterated. It is difficult for those who did not live through that era to imagine the pervasiveness of its fears; only the post-September 11 anxiety over potential terrorist attacks comes close to the sense of dread that accompanied, for example, the Cuban Missile Crisis. Although bomb shelters were a notable feature of American life around 1960, cultural references to them were more or less gone from American discourse a scant decade later. In a 1970 article in Esquire, Roy Bongartz noted that the shelter phenomenon somehow already “seems very far away from us, as remote as the French Maginot Line of the Thirties....The great shelter boom, although well within range of the childhood memories of our newest teenagers, is dead as a mackerel and gone from our minds.” In the early twenty-first century it is even harder to find much recollection in popular culture of that segment of American history. It is as if those extraordinary national terrors have been scissored out of the communal consciousness. Which isn’t to say that our popular culture has refrained from portraying our nuclear unease, albeit indirectly. There has long been a flourishing industry that turns visions of apocalypse into profitable books, motion pictures, video games, and other entertainment products, from doomsday novels and films like Neville Shute’s On the Beach (1957) and Stanley Kubrick’s Dr. Strangelove (1964) to the many other science-fiction movies set after a nuclear Armageddon. Meanwhile, starting in the Sixties, Marvel Comics created a vast mythology in which nuclear phenomena did not annihilate the world but rather created a new generation of American superheroes: an incarnation of a youthful Everyman who obtained spider-like powers as a result of a nuclear accident; a good man who, in a fusion of the stories of Frankenstein, the Golem, and Dr. Jekyll, was transformed periodically into a being of incalculable power after exposure to the radiation of an atomic blast; a team of researchers who acquired abnormalities of ability and appearance when their scientific work caused them to be bombarded by radiation; a man involved in an accident with nuclear materials that left him blind but gave him preternaturally heightened senses that more than compensated for his lack of vision; and a group of teenagers for whom the specter of mutation, one of the most terrifying sources of speculation related to radiation, was instead a benignly natural process that produced not deformed monsters but a superior strain of humanity, led by a noble scientist whose mental abilities were enhanced because of his father’s involvement in early U.S. nuclear experiments. (Namely: Spider-Man, the Hulk, the Fantastic Four, Daredevil, the X-Men, and Professor X.) Marvel and its imitators came to use this nuclear folklore as a tapestry within which to weave discussions of moral issues ranging from war and race relations to poverty and drug abuse. Whatever the merits or limitations of the comic book as an art form, these stories clearly tapped veins of popular American sentiment. The public disfavor toward nuclear physics has not just grown out of fears of nuclear warfare and devastation. It is also connected to a broader wave of skepticism about science and technology beginning in the middle of the last century, which should itself be understood in relation to a recurring strain of dissatisfaction with modern life. To better understand this dissatisfaction, consider its opposite, the technological optimism embodied by Herman Kahn. Kahn (1922-1983) was a scholar of systems theory, military strategy, and nuclear weapons policy at the RAND Corporation, an independent think tank established by the U.S. military after World War II. He recognized the great difficulty felt not only by the general public, but also by intellectuals and policymakers, in thinking and talking openly and objectively about nuclear technologies and nuclear war. He called it “thinking about the unthinkable.” Kahn’s book On Thermonuclear War (1960) was shocking in that it plainly discussed the prospect of a nuclear war between the United States and the Soviet Union, described such a war as survivable, and systematically projected various steps for survival. 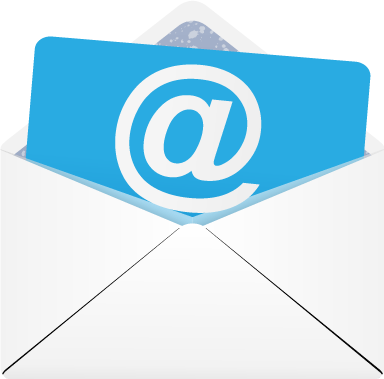 Is there really a Herman Kahn? It is hard to believe. Doubts cross one’s mind almost from the first page of this deplorable book: no one could write like this; no one could think like this. Perhaps the whole thing is a staff hoax in bad taste....This evil and tenebrous book, with its loose-lipped pieties and its hayfoot-strawfoot logic, is permeated with a bloodthirsty irrationality such as I have not seen in my years of reading. This extraordinary moral condemnation in a scientific magazine’s review of a scholarly work — and the magazine’s subsequent refusal to allow Kahn to respond in either an article or a published letter to the editor — shows the extent to which the engagement of nuclear issues had become tied to philosophy and ideology. Kahn’s startling willingness to discuss the most unsettling aspects of nuclear power may have been the most sensational feature of his work, but its more telling component was its philosophical subtext about the links between technology and American institutions. It is this subtext that connects Kahn with the intellectual convulsions that racked America in the Sixties and Seventies — upheavals concerned with a sincere desire, felt across the political spectrum, to fit the powers of technology into a coherent moral and philosophical framework. If Kahn was the paragon of cold-eyed nuclear optimism, then Lewis Mumford was an exemplar of the opposing sensibility. Mumford (1895-1990) lived through two world wars of previously inconceivable scope, the infliction on the community of nations of extraordinary misery at the hands of empires and monolithic states, an ominously growing degradation of the physical environment, and, ultimately, a dread of annihilation through nuclear technology. His early faith in the transformative power of good will and human ingenuity was overshadowed, as the twentieth century unfolded, by an alarm at human destructiveness and a profound suspicion of enormous, dehumanizing structures, whether in the form of social systems or cityscapes. Mumford first became widely known as an urban theorist; as such, he was inheritor to an anti-urban tradition extending from the birth of the Republic through literary icons like Emerson, Melville, and Dreiser to philosophers and critics like Henry Adams, William James, George Santayana, and John Dewey. Disenchantment with technology is so integral to this tradition’s rejection of the social, environmental, and aesthetic potential of urban development that in order to develop his moral critique, Mumford, though he had no university degree, transformed himself into one of his era’s most respected voices on the history of technology. In the Sixties, the reaction against technology fused, in mass culture, with a resentment of the materialism associated with corporate life. Charles A. Reich’s 1970 bestseller The Greening of America captured the ethos of a hippie subculture promoting a simpler, more contemplative lifestyle, free of technological contrivances. Tranquil pastoral imagery was a favored device in the songs, poetic writings, and slogans of the time. The natural was equated with the spiritually superior. Flowers, the wind, and grass became symbols of emancipation and enlightenment, and “Flower power” was a catchword of the day, with a return to nature serving as a metaphor for other kinds of social transformation. Thus, while Kahn’s vision of American life held that the nation’s advanced technologies, industrial capabilities, and social and economic traditions and institutions were forces for good, the environmental and anti-nuclear movements were built on a philosophical tradition that tended to characterize science and technology as repressive tools of military and commercial interests. Insofar as the environmental movement has now reached a point of cultural ascendancy, technological skepticism has become an unmistakable feature of the American mindset. But it is hardly dominant. The fallen reputation of nuclear science cannot simply be attributed to techno-skepticism so long as the countervailing techno-optimism remains a powerful force in American life. To truly understand the nation’s attitude toward things nuclear, we must turn to biography and philosophy. Albert Einstein rose as a towering public incarnation of the human hunger to pursue and articulate knowledge in a form that not only confers power but also brings meaning and dignity to human life, and a deepened understanding rather than just an accumulation of facts. Part of his success as an icon of science can surely be chalked up to his social skill. Although he had no love for social occasions, Einstein was not at all averse to limelight. He was quite comfortable with people in small or large gatherings provided he could comport himself on his own terms. A substantial part of these terms involved the deliberate projection of the image of not just a great scientist but a philosophical ambassador: someone who acknowledged that what the intellectual marketplace wanted from nuclear physics was not only technology, not only an element of strategic statecraft, but a source of insight that could be combined with more ancient pursuits of wisdom. But if Einstein generated myths around his personality, it was in large part because he instinctively sought to connect a life in physics with greater moral and metaphysical questions. Einstein treated his physics as a portal to an understanding of reality that could transcend more mundane notions of science. He sought to build intellectual bridges between the new scientific picture of the universe and traditional cosmologies; he sensed that his general ideas about reality could be brought into creative alignment with the great intellectual traditions of the humanities. He had no illusions about his own capacity to effect such an alignment; he never forayed into systematic philosophy. He saw himself as an encourager. The role of ambassador, of peacemaker among philosophical tribes, was congenial to him. These discussions were in some ways disappointing, for, although all three of them were Jews and exiles and, in intention, cosmopolitans, I found that they all had a German bias towards metaphysics, and in spite of our utmost endeavors we never arrived at common premises from which to argue. can only be created by those who are thoroughly imbued with the aspiration towards truth and understanding. This source of feeling, however, springs from the sphere of religion. To this there also belongs the faith in the possibility that the regulations valid for the world of existence are rational, that is, comprehensible to reason. I cannot conceive of a genuine scientist without that profound faith. The situation may be expressed by an image: Science without religion is lame, religion without science is blind. These somewhat strained attempts to elevate a universal sense of piety into a philosophical lingua franca were only the surface of Einstein’s metaphysical interest. He had a distinct predisposition toward the types of non-scientific speculative thinking that British empiricists abjured. He expressed such inclinations in writings that ranged from criticism of Russell’s epistemology (which he found excessively prejudiced against metaphysical inquiry) to popular commentary on the relationship between physics and reality. One of Einstein’s most famous utterances, that God does not play dice, expressed complicated reservations he had about the apparent implications of the new field of quantum mechanics for broad philosophical concepts like causality. Moreover, his devotion of the last decades of his life to an unsuccessful quest for a unified field theory, which would bring into a fuller conceptual coherence various areas of physics such as electromagnetism and gravitation, was evidently motivated as much by philosophical as scientific impulses — and is evocative of the desire for unified knowledge that pervades the European philosophical tradition. If Einstein epitomized a certain European stance on the cultural presentation of physics, a parallel position for the United States was occupied by J. Robert Oppenheimer. Einstein was a world figure on an American stage; Oppenheimer was an American figure whose persona and career encapsulated much that is distinctively American in the philosophical struggles surrounding nuclear science. Like Einstein, Oppenheimer felt that the delivery of nuclear power into human hands was a momentous event in the moral and philosophical saga of our species. Unlike Einstein, he had been instrumental in developing the first atomic bombs: he served as scientific director of the Manhattan Project, which developed the bomb, and from 1942 to 1945 he headed the atomic energy research group at Los Alamos. This practical involvement in the advent of nuclear technology was in addition to his important theoretical contributions in areas including quantum theory and anti-particles. He was also drawn into a byzantine web of political suspicion and persecution during the height of the Red Scare, subjecting him to a tormenting ordeal with grave repercussions for his career and reputation. He chaired the general advisory committee of America’s Atomic Energy Commission from 1946 to 1952 but opposed the production of the hydrogen bomb and the atomic arms race with Moscow. He came under fire from critics — most notably physicist Edward Teller, the “father of the hydrogen bomb” — and was subjected to a public hearing and deprived of his security clearance, with the commission suspending him as director on the grounds that he was a national security risk. One might think that this searing experience would provide so gifted and sensitive a man with inspiration (or compulsion) to formulate a towering philosophical and policy statement of not only the moral challenges of vast technological power but also its potential for enhancing human life. But this did not happen. Oppenheimer did indeed write commentaries on nuclear problems; they are articulate and even passionate, but strangely disappointing and anti-climactic. It is as though a brilliant individual were whisked back in time to witness the birth of the cosmos and then returned to our own time to document it, and the result was a book that chiefly complained about the discomfort of the trip. Oppenheimer’s publications for the general public, like Science and the Common Understanding (1954), The Open Mind (1955), and The Flying Trapeze (1964), offer popularizations of the concepts of atomic physics coupled with philosophical-sounding but ultimately empty generalizations about the inevitability of scientific change. The Open Mind offers commendable but vague calls for international peace. It is curious that Oppenheimer makes so little of the debates within scientific circles as to the uses and abuses of atomic weapons. Given his personal odyssey, one would have expected, and welcomed, such an exposition. When Oppenheimer overcomes this private antinomy, perhaps he will be in a better position to understand that the schisms of life are not just to be gazed at in reverential awe, but must be grappled with and resolved. This criticism should not be seen as a denigration of Oppenheimer. We are lucky to have any record at all of his impressions, let alone as well-written and thoughtful as are the ones he left us. They carry the clear stamp of a great spirit. But it is precisely because of this that his commentaries are frustrating, because they so enticingly suggest that here is someone who might have produced the philosophical synthesis for which Einstein hoped — a philosophy of technology that would make us grateful for the new physics and its technological offshoots, instead of regretting that these had ever come about. Born in 1904 into a Jewish family that supported New York’s Society for Ethical Culture, a group dedicated to the development of universal moral principles that were not based in any mainstream religion, Oppenheimer received his early education at one of the society’s schools. After studying at Harvard he began looking for spiritual fulfillment in literature ranging from Hindu scripture to the poetry of T. S. Eliot, Shakespeare, and John Donne, as well as Dostoevsky. His interest in the Gita was so strong that he learned Sanskrit so he could read it in the original. These debates were concerned more and more with the most basic problems of epistemology. Had the discoveries of atomic physics abolished the duality between the human observer and the world observed? Was there no longer any real distinction between subject and object? Could two mutually exclusive propositions on the same topic both be regarded as correct from a loftier standpoint? Would one be justified in abandoning the view that the foundation of physics is the close connection of cause and effect? But in that case could there ever be any such thing as laws of Nature? Could any reliable scientific forecasts ever be made? was more and more to be found in government offices, less and less in the lecture room. He had become the oracle of diplomats and strategists. A new stage had begun in the career of this extraordinary man. The fact could even be noted in his altered appearance and behavior. He now wore his graying hair cut very short — as if to prove even by this detail that he was no longer one of the “long-haired.” His movements had a military abruptness....He was regarded as a “scientific statesman”....Oppenheimer’s friends, however, believed that Washington’s influence on him was greater than his influence on Washington. He then metamorphosed from a “scientific statesman,” a gray eminence to the great of the military and political worlds, into a political outcast and a bearer of the conscience of science for having brought the nuclear fires of Prometheus to Earth. Oppenheimer’s life and thought in the end acquired the quality of tragedy, of neurotic self-immolation, of paralysis of existential crisis, and ultimately of squandered talents. But despite this active involvement in some of the burning American controversies of his time, Einstein was never an American figure in the way that Oppenheimer was. This had nothing to do with his foreign birth. Although Einstein became an enduring member of America’s pantheon of pop-culture icons, he transcended national boundaries. His Olympian remoteness was essential to his appeal. Like Mother Teresa and Nelson Mandela, he was a champion of values that many Americans admired, rather than an avatar of America. By contrast, Oppenheimer’s story is a tapestry of quintessentially American passions and anxieties derived from the nation’s long love-hate relationship with technological innovation. But taken together, the stories of Einstein and Oppenheimer make clear that the practical promotion of nuclear science in our society is related to our ability to promote it philosophically. It may seem counterintuitive that the development of a science, especially a science as rigorous as nuclear physics, should in any way depend on philosophical activity. To some scientists the notion may be repugnant or even nonsensical. Yet the loss of prestige of nuclear physics in the second half of the twentieth century presents itself forcefully as a decline due to philosophical failure. And both the failure and the philosophical reasons for it emerge as an object lesson from Oppenheimer’s life. Oppenheimer stands for the conflict that exists in American culture about the power of advanced technology. It is a painful conflict, which is why, despite Oppenheimer’s massive media exposure during his lifetime and since his death, he remains a strangely ethereal presence in American culture. His visage twice appeared on the cover of Time magazine; viewed side by side, these portraits capture a great deal. The first, in color, from 1948, has as background a blackboard filled with mathematical symbols. The face could belong to a movie idol of that era. The eyes are those of both a seeker and a man of affairs, fixed on a distant point, dark hair swept back, distinguished touches of gray at the temples. The caption is a famous Oppenheimer quote: “What we don’t understand we explain to each other.” The second cover is from June 14, 1954, the time of the national security ordeal. The image is monotone gray. The hair is cropped close to the skull, the facial bones prominent. The eyes bleakly stare straight out at you above an ominous caption: “Beyond loyalty, the harsh requirements of security.” The questions in these eyes have haunted the public perception of nuclear technology for half a century: How is our civilization changed by high technology? How well do we understand the making of technology as a moral activity? How ought we to integrate our high technology with our mores and traditions? Einstein’s philosophical sophistication was more than equal to the task of appreciating the importance of these questions, but the timbre of his metaphysical voice was that of the seventeenth-century Dutch philosopher Baruch Spinoza, whom he admired. It was the voice of a sublimely dignified rationalism, deterministic and pantheistic, finding contemplative joy in the acquiescence of the ego before the aesthetic majesty and intellectual harmonies of a vast cosmos. Oppenheimer’s philosophical voice was not at all like this. He was, rather, a spiritual cousin of Søren Kierkegaard, the nineteenth-century pioneer of existentialism, with whom he shared suffocating presentiments of constraint within the mental climate of his generation. Like the troubled Dane, Oppenheimer brought a penetrating intelligence to ethical and speculative issues that he considered urgent but that many of his contemporaries found marginal, or reducible to acceptable solutions within prevailing customs. No less than Kierkegaard, he was responsive to soaring flights of mind that transcended everyday existence but saw them as meaningful only if they could be correlated with personality, subjective tribulations, and fine details of individual emotion. He wanted technology to be based on a philosophy that recognized human fears and hopes without losing them in visions so enormous that they vanished or became trivial. Such yearnings are all too easy to caricature. But their very existence draws out a troubling paradox for our time: A cultural reaction against a technology, on the grounds of the philosophical problems to which the technology gives rise, can have the effect of paralyzing the very philosophical labors that are needed to solve those problems. Oppenheimer acutely felt the limitations of an attitude that placed what he saw as excessive and naïve faith in the ability of government structures (however democratically elected) to address the philosophical problems created by powerful new technology. It was necessary, he believed, for scientists outside government to concern themselves with philosophically interpreting science to society. But the intensity of Oppenheimer’s feelings on these topics seemed to be his worst enemy. He was never able to find a way of expressing the need to promote nuclear science in a way that would emphasize its potential as a positive force in the world. He died waiting for a gift of tongues that never came. America’s self-image and sense of national purpose have long been colored by perceptions of the nation’s ingenuity, industrial resourcefulness, and devotion to progress. And although Americans like to think of themselves as a technologically driven society, and even as the world’s technological leader, the second half of the twentieth century has in important respects been a period of technological retreat for the United States. The country’s infrastructure has notoriously fallen into disrepair. Obsolete fuel technologies have been used for decades, with negative economic, strategic, and environmental consequences. The manufacturing base has evaporated, and other countries are leading in several areas of high technology. This technological retreat is related to the loss of prestige of nuclear physics. Both have their roots in a failure to develop a philosophy of scientific and technological innovation capable of interpreting such innovation as a moral enterprise, and of seeing science and technology as vital cultural institutions rather than as areas of intellectual activity separate from the imaginative life of the nation. For a country that considers itself in the van of the march of progress, the United States has had a remarkable dearth of popular philosophical justifications of scientific and technological advance. To be sure, occasional artifacts of science boosterism, like astronomer Carl Sagan’s 1980 television series Cosmos, seek to present scientific advancement as a moving adventure of the spirit. But as useful as such popular educational products are, the insertion of quasi-religiosity into scientific exposition is no substitute for a considered philosophy that relates scientific inquiry and technological innovation, in ways both widely accessible and imaginatively satisfying, to older pursuits of human value and social purpose. American culture has established what is in effect an intellectual tradition of suspicion of nuclear science even while it has enshrined in mass entertainment products like the Star Trek television and motion picture franchise, an identification of advanced physics with wonder and prospects for the betterment of humankind. The apparent contradiction between these cultural currents is resolved, even if only superficially, in a mythic figure such as Einstein, who seems to assure us that the advance of science is compatible with cosmic insight, even if lesser mortals than Einstein cannot understand precisely how. Einstein appeals to the faith of those who want to believe that science and philosophical wisdom belong together and need not clash. Like everything else made by human hands and minds, science and technology can run down. To flourish — even just to survive — they need sustenance of various kinds, including philosophical support that links them to the imaginative hungers of the cultures in which they would endure. For better or worse, the United States has come to depend on technological progress, and if its continuance as a society in anything resembling its traditional forms is to be assured, technological vitality must be sustained. Nuclear science is so central to the continuum of scientific and technological progress that a failure to restore its stature must bode ill for the long-term future of science and technology in America. Another reason to restore the prestige of nuclear science is more specific and immediate, and has to do with the interests of both the United States and the rest of the world. It is now widely accepted that it is in the geopolitical and economic interest of the United States to diversify its national energy resources. There is also wide support, both scientifically and politically, for the adoption of a national energy policy that would minimize global impacts on the physical environment. From both these perspectives it is desirable to expand the United States’s use of nuclear technology, in the forms of nuclear power stations and techniques for the storage of nuclear waste. These objectives will be met only if public perceptions of nuclear technology are considerably improved. How can this be done? The most straightforward possibility would involve a mass education campaign aimed at connecting nuclear science and technology to uncontroversial public priorities — like economic strength, independence from foreign sources of energy, and a reduction in atmospheric pollution. Such a campaign should emphasize the salient data — like the fact that only a fifth of U.S. electricity comes from nuclear plants, while more than three-quarters of France’s electricity does — without resorting to the garish fantasies of atomic utopia that characterized the immediate postwar period. Meanwhile, there remains philosophical work to be done. The questions concerning technology that tormented Oppenheimer, and the yearning for a philosophical resolution of them, were not the imagined anxieties of a neurotic individual but a sensitive man’s reflection of perplexities that run deep in American culture, sometimes shaping public policy. In short, America needs a philosophy that is capable of contextualizing the scientific adventure satisfyingly within the American spirit. To this end, it is necessary to take into account the cultural forces that have nurtured that spirit and made it what it is. Whether such a philosophical synthesis is achieved will determine not only the future fortunes of specific sciences, such as nuclear studies, but also the general character of America’s relationship with advanced technology in years to come. America is nearing the point where it must choose between two competing visions of advanced technology and the science that informs it. One is that of a morally sustainable mission in pursuit of an achievable dream of a better world, nourished by a philosophy that fulfills the imaginative needs and self-image of the American people. The other vision that looms, if a philosophical synthesis is not achieved, is one of technological failure, of the erosion of the sense of national purpose, and of a tragically increasing association of the wondrous potential of science and technology with anxiety, fear, and persistent nightmare. N.J. Slabbert is coauthor, with Aris Melissaratos, of Innovation, the Key to Prosperity: Technology & America’s Role in the 21st Century Economy (Montagu House, 2009). N. J. Slabbert, "The Lost Prestige of Nuclear Physics," The New Atlantis, Summer 2009, pp. 28-44.